No collection of Napoleon memorabilia would be complete without renowned battles scenes engraved by Carle Vernet, one of the most gifted artists at the Imperial Court. In 1806 Carle Vernet portrayed Napoleon’s military campaigns in Italy. His works done as copper plate engravings differ in size ranging from 10″ x 13″ to 12″ x 16″. They provide a remarkable pictorial record of Bonaparte ‘s military achievements. 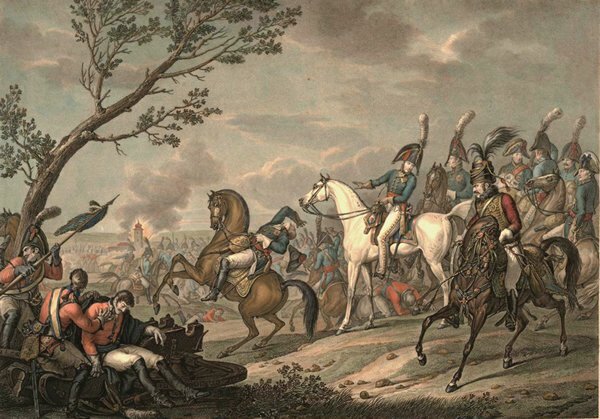 Due to clarity typical for copperplate engravings Vernet was able to portray battles in great detail. He skillfully depicted maneuvering armies shown soldier-by-soldier. The officers riding beautiful horses are particularly noteworthy. Some of these battle scenes feature the Emperor mounted on his splendid white Arab stallion. Among outstanding engraved battle scenes by Vernet are the capture of Naples, Entry into Turin, Battle of Mondovi, The Liberation of Corsica, Battle of Roveredo, The Revolt of Pavie, Battle of La Favorite, and many others. All these unique authentic engravings are in excellent condition, with ample margins are no foxing within the image area.